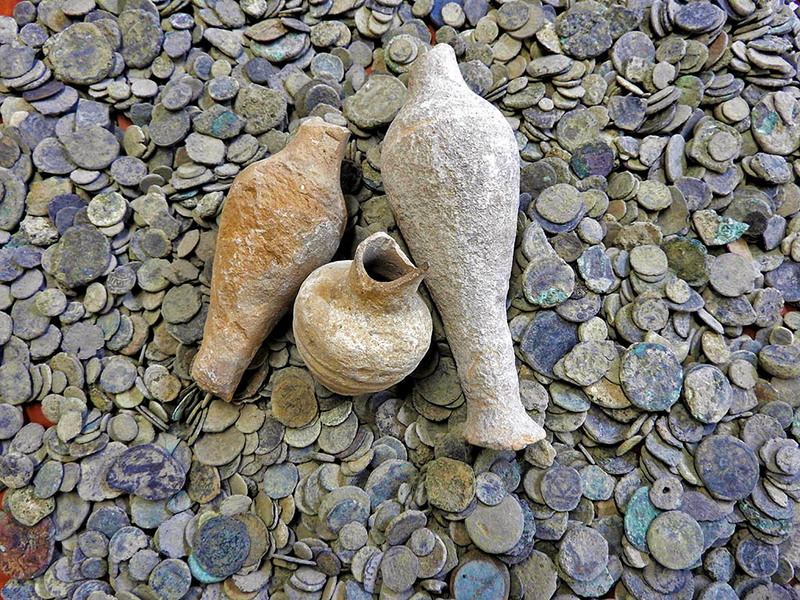 Pottery and coins confiscated by the Israel Antiquities Authority near Beit Shean, Nov. 24, 2015. Photo: IAA. The unnamed “dealer” had been digging up the coins and pottery in fields in the vicinity of Beit Shean. For additional information about Beit Shean see our post here. There are legitimate dealers in antiquities, but there are others who take advantage of unsuspecting buyers. Many antiquities are destroyed by those who do not appreciate the value of the artifacts. For a copy of the IAA Hebrew press release go here. For an informative English article with several photos see the article in The Times of Israel here. Over the past years I have posted several sunrise photos made from the western shore of the Sea of Galilee, but only a few sunsets from the eastern shore. I want to share this beautiful sunset view from En Gev. 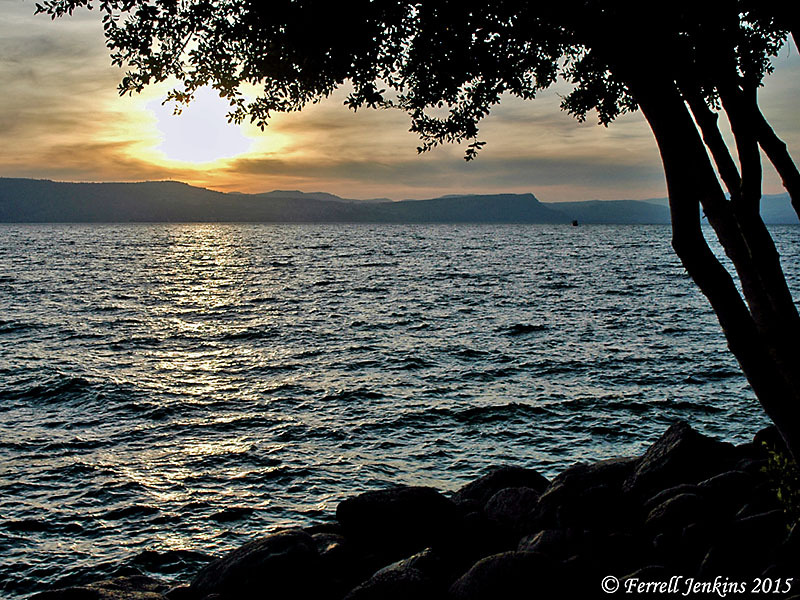 Sunset from En Gev on the eastern shore of the Sea of Galilee. Photo by Ferrell Jenkins. If you look carefully you may see the Horns of Hattin and Mount Arbel on the western side. The sea is a little rough in this photo due to the afternoon wind that comes in from the northwest. In the Old Testament Lod is listed as a town of the tribe of Benjamin (1 Chronicles 8:12), but it seems significant only after the return of the Jews from Babylonian exile (Nehemiah 11:25; Ezra 2:33). In the New Testament the town is known as Lydda and the place where the Apostle Peter preached and healed a paralytic named Aeneas (Acts 9:31-35). In modern times Lod is the location of Tel Aviv’s Ben Gurion International Airport. You might enjoy this account by the Israel Antiquities Authority about the discovery of another impressive mosaic in Lod. An impressive mosaic revealed in archaeological excavations by the Israel Antiquities Authority in Lod will be open for the first time this week, specifically for visits by the public, in cooperation with the Lod municipality. 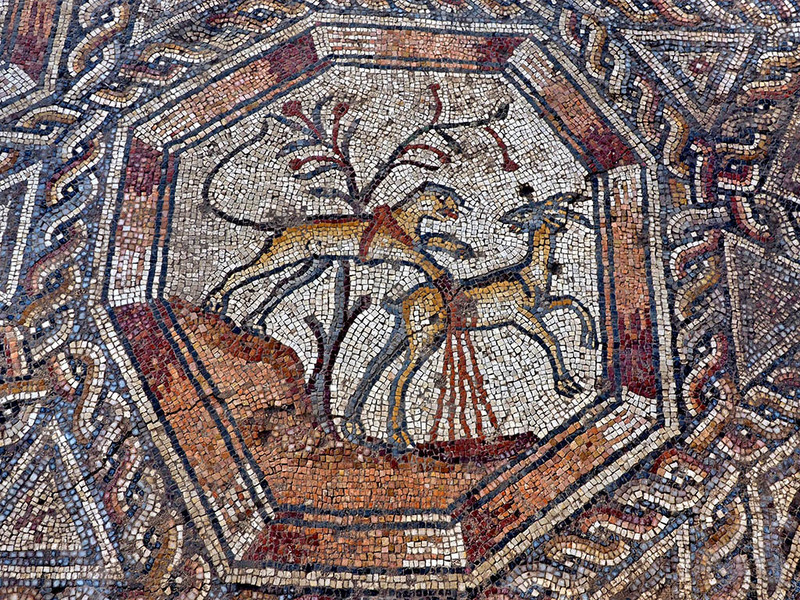 In June–November 2014 a team of archaeologists from the Israel Antiquities Authority directed a large excavation in the Neve Yerek neighborhood of Lod, in an area where a breathtaking mosaic that served as the living room floor in a villa some 1,700 years ago was previously exposed. The aim of the excavation was to prepare the ground for construction of a visitor center, to which the beautiful mosaic will be returned when it completes a series of exhibitions in museums around the world. 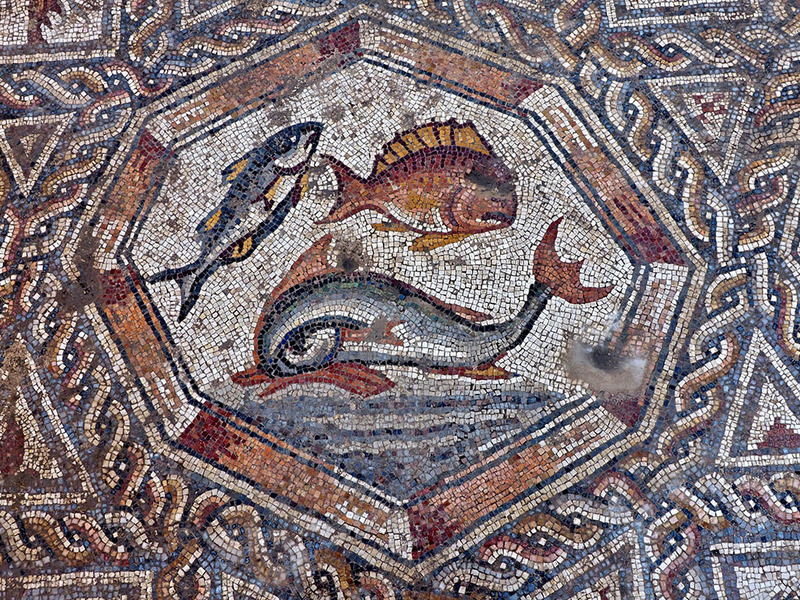 Important artifacts were discovered in the new excavation, the most notable of which is another colorful mosaic (11 × 13 m) that was the courtyard pavement of the magnificent villa that had the famous mosaic in its living room. According to Dr. Amir Gorzalczany, excavation director on behalf of the Israel Antiquities Authority, “The villa we found was part of a neighborhood of affluent houses that stood here during the Roman and Byzantine periods. At that time Lod was called Diospolis and was the district capital, until it was replaced by Ramla after the Muslim conquest. The building was used for a very long time”. The northern part of the complex, where the “Shelby White and Leon Levy Lod Mosaic Center” will be constructed, was exposed when the Israel Antiquities Authority was inspecting development work being carried out in the early 1990s prior to the construction of Highway 90. The mosaic, which was discovered and excavated at that time by the late Miriam Avissar, is among the most beautiful in the country, and has been exhibited in recent years in some of the world’s leading museums, including the Metropolitan, the Louvre and the State Hermitage etc. It is currently on display at the Cini Gallery in Venice, Italy, and in the future it will be housed in the main building to be erected in Lod. The southern part of the complex was exposed in the current excavations. Among other things, it includes a large magnificent courtyard that is paved with a mosaic and surrounded by porticos (stoas–covered galleries open to the courtyard) whose ceiling was supported by columns. According to Dr. Gorzalczany, “The eastern part of the complex could not be completely exposed because it extends beneath modern buildings in the neighborhood”. The scenes in this mosaic depict hunting and hunted animals, fish, flowers in baskets, vases and birds. Dr. Gorzalczany added, “The quality of the images portrayed in the mosaic indicates a highly developed artistic ability”. Numerous fragments of frescoes (wall paintings prepared on wet plaster) reflect the decoration and the meticulous and luxurious design, which are in the best tradition of the well-born of the period. In light of the new discoveries, this part of the villa will also be incorporated in the visitor center. Archaeologists Hagit Torgë, Uzi ‘Ad, Eriola Jakoel and Yossi Elisha of the Israel Antiquities Authority participated in the excavation. Media commentators have spoken of the long relationship between France and the United States of America. We may disagree vigorously with various French policies, but in times like this we join in deep concern for the attack on freedom and human life that Paris has recently experienced. 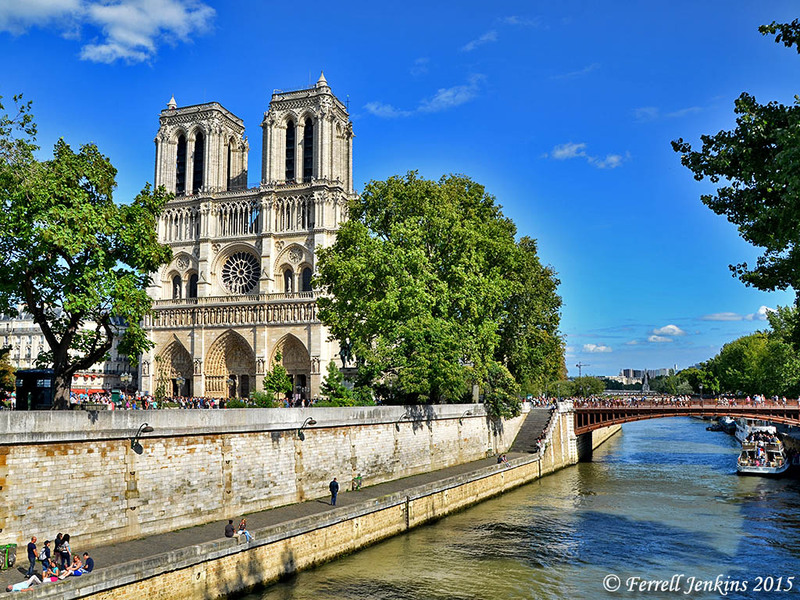 Notre Dame and the River Seine. Photo by Ferrell Jenkins. I have visited France on several occasions. When I have that opportunity I always try to visit the Louvre Museum at least twice during my stay. French archaeologists have worked throughout the Middle East and brought many of the artifacts to Paris for display. When I first became aware of those little books on Biblical archaeology by Prof. André Parrot, I purchased used copies of everyone I could locate. Parrot was for a time Curator-in-Chief of the French National Museums, Professor at the Ecole du Louvre, and director of the Mari Archaeology Expedition. Mari is in Syria. The Louvre displays numerous items from Syria. How many of you have traveled in Syria and visited the archaeological sites and the wonderful museums? Not so many, I suppose. But many have visited the Louvre in Paris and seen some of the greatest discoveries of the ancient world. The photo below shows the display from Ugarit (Ras Shamra), a city on the Mediterranean coast of Syria a few miles north of Latakia. The excavations were conducted by French archaeologists Claude F. A. Schaeffer. Baal is portrayed as the Canaanite god of grain, weather, and war. This, and the Ugaritic documents displayed in the Louvre, provided much background information for those who study the Bible. 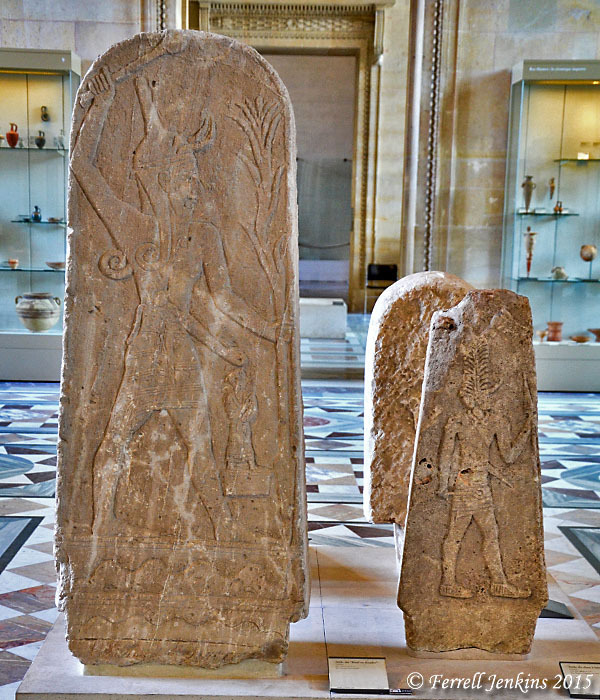 Stele of Baal from Ugarit (Ras Shamra). Displayed in Louvre. Photo by Ferrell Jenkins. The great archaeological work by the French is much appreciated. Time would fail me to tell of all of the French archaeologists who have contributed to our knowledge. A recent evening news report on the Syrian refugees trying to reach some semblance of safety in Europe shows the dangers they face trying to get from Turkey to the Greek island of Lesbos. Some of the heavily loaded rafts and small boats have overturned in the rough sea. Why is that? It is because of the approach of winter. Keep that thought in mind and we will return to it. 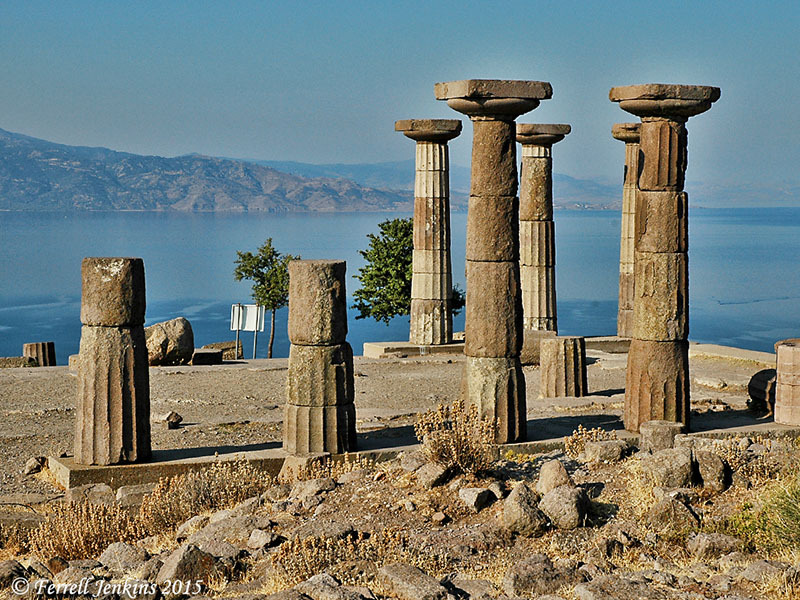 Our first photo shows the ruins of the temple of Athena at Assos. The Aegean island of Lesbos is visible across the strait. A view of Lesbos across the strait from Assos and the ruins of the temple of Athena. Photo by Ferrell Jenkins. The island across the strait is Lesbos. 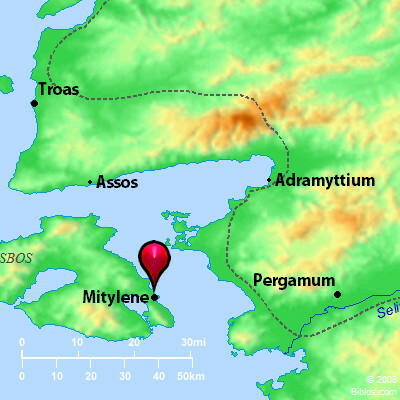 Follow the island coastline south and you will come to the town of Mitylene. The Greek island of Lesbos is close to modern Turkey. Credit: biblos.com. Paul, having experienced his own shipwreck on the way to Rome, knew of the danger of traveling too late in the year. We are told that there were 276 persons aboard the ship that wrecked on Malta (Acts 27:37). 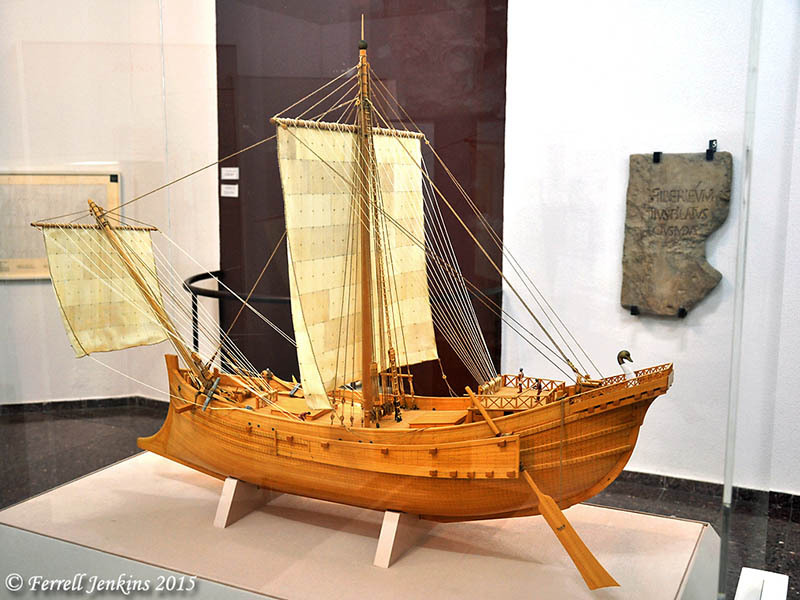 Model of ship like Paul would have used on his voyage to Rome. Rali Museum, Caesarea, Israel. Photo by Ferrell Jenkins. The ships that regularly cruise the Aegean Sea are only about half the size of those we are accustomed to in the Caribbean. They sail from April through mid-November. After that the sea is too rough. Imagine the horror of taking one’s family out on the sea in a small raft during the winter season?